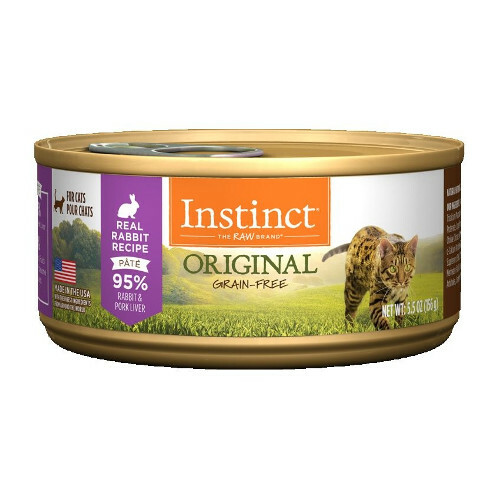 With Instinct, your cat will enjoy a hearty and nutritious diet, free of grains or fillers. Such quality nutrition provides beneficial proteins and balanced omega fatty acids to maintain toned muscles, healthy skin, and a glossy coat. Real meat. Wholesome fruits and vegetables. This is your cat’s instinctive diet. With Instinct, your cat will enjoy a hearty and nutritious diet, free of grains or fillers. Such quality nutrition provides beneficial proteins and balanced omega fatty acids to maintain toned muscles, healthy skin, and a glossy coat. Feed instinctively to give your cat the nourishment and energy to enjoy life every day. Plus, try rotating with our other nutritious diets – your cat will love the variety. Nature’s Variety Instinct Rabbit Formula for cats is formulated to meet the nutritional levels established by the AAFCO Cat Food Nutrient Profiles for all life stages.